It’s nice when the things you own can reflect your personality and style, and that is easy and fun to do with a golf cart. Gulf Atlantic Vehicles has been New Smyrna Beach’s trusted golf cart source since 1965! For four generations, our family has provided top-quality golf cart sales and service to the New Smyrna Beach area. Our service department is fully staffed with professional, expertly trained technicians and our accessories inventory is enormous! Gulf Atlantic carries golf carts in all the top lines and offers hundreds of options and accessories to create the perfect custom vehicle for your needs. So, go ahead and put your stamp on it! The options are endless at Gulf Atlantic Vehicles, so you can turn your golf car into exactly what you want. If your older parent or teenager will be enjoying the cart, safety may be your main concern. You can add a host of safety features, including rearview mirrors, brake lights, safety belts, turn signals, reinforced windshields with wipers. There are even headlights for night driving. Maybe comfort, convenience, and practicality are more your thing. Golf cars with roofs can have a roof rack, storage rack, and a cooling fan. Some manufacturers even offer solar roof options, which help reduce charging costs of electric carts to practically zero and reduce the carbon footprint for all of the energy-conscious golf cart owners out there. And then, of course, there is style! 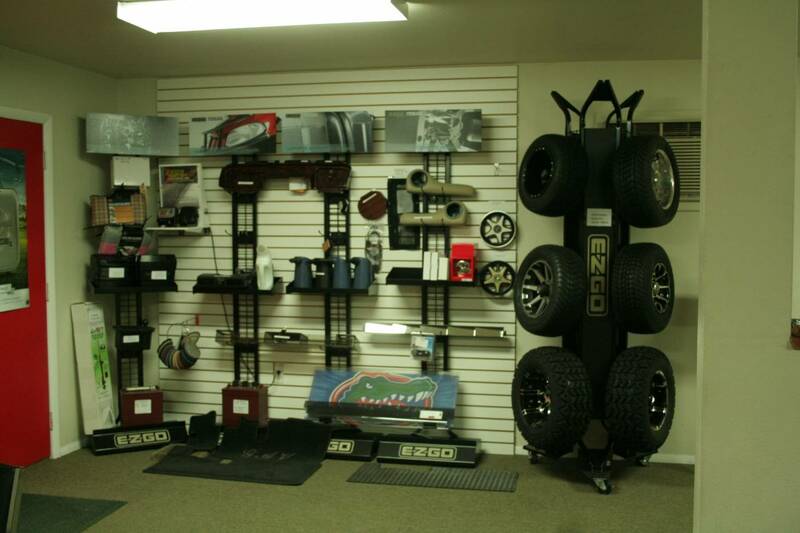 Get cool custom tires and rims, tint your windshield, add brush guards…and even fender flairs and rocker panels! You can even “wrap” your cart in any number of ways. Wrap it in camo, color it hot pink or make it look like a Cadillac. The choice is yours! The world is your oyster when you customize at Gulf Atlantic Vehicles. You can add anything from coolers to carpeting, to cup holders, extra seating, stylish seat covers, a GPS unit or stereo. However you choose to accessorize your golf cart, Gulf Atlantic can make it happen! Just visit our convenient location on Pioneer Trail in New Smyrna Beach or call us at 386-427-9778.